I stopped by the health food store today to purchase some gluten-free oats and it was obvious that something special was going on. 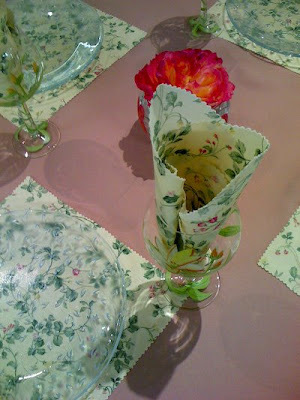 In the back of the store, tables were set up with beautiful settings of fabrics, flowers, and clear glass tableware. A side table held a lovely display of clear glass beverage ware and serving trays. A cookbook display was set up with interesting vegan recipe books. I was very interested in the table linens. They were effective, beautiful, elegant, and inexpensive! The presentation was quite stunning. Matching table clothes covered each table. 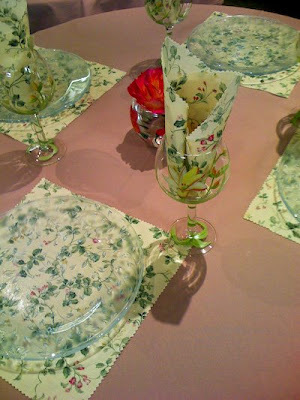 Place mats and napkins were simply squares of chintz fabric that had been cut into squares with pinking sheers for a pretty edged effect. There was not sewing, lining, or fuss --- just pinked squares of fabric cut from a beautiful print. 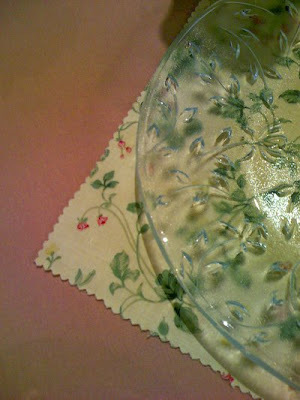 Chintz fabric has wonderful "body" and a pretty "sheen" to the top side. Made from cotton, it washes and wears very well. I didn't have my camera with me, but my cell phone camera worked quite well in getting these pictures to share with you. I was curious about the "event" that would be taking place, so asked a few questions of the store owner. She said that she is hosting a "vegan gastronomical event" this evening for a group of twenty individuals. It's a seven course, sit down, candlelight dinner consisting of only plant foods. Local fresh herbs from a nearby herb farm will be featured. Hors d'oevres will be served, recipes shared, prizes given, and vegan cooking demonstrations presented. The vegan feast will be featuring recipes from the Vegan Vittles cookbook. Doesn't it sound like fun? *Note that although the "shiny" is only on one side of the chintz print, the design is visible from both sides. This is important to keep in mind when choosing a project like this, as the folded napkin looks best with pattern on both sides. what a wonderful idea, I have always liked clear dishes and now with that for inspiration i may need to think about getting some more! Very pretty and a great idea! WOW, what a wonderful idea. I will be looking for chintz and pinking shears!! Thanks for the info. That is a wonderful idea. I have beautiful fabric that would work perfectly in such a way. What a cute idea! So nice with the clear plates. oh this is lovely and I love the dishes that are clear glass, they are elegant and understated and actually much healthier to use. They sure show off the fabric, a clever idea to be sure. I'm curious, and I don't know that much about different kinds of fabric but wouldn't it fray? Maybe chintz doesn't but I would like to know before I make some of these lovely placemats and napkins and have the edges fray on me. They are so lovely, I hope it works!